Every single one envied our residency in this beautiful state. They spent a lot of money to enjoy a vacation here. Some had dreamed of visiting Maine for many years. Some come every year. Gov. 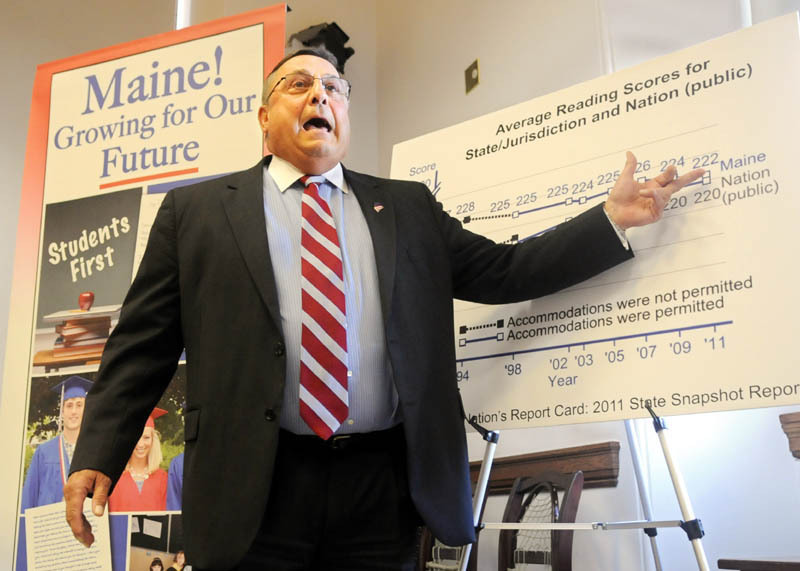 Paul LePage could not be more wrong, and his continued negativity about this state is embarrassing, hurtful and harmful. He should take pride in our kids, not tear them down. Telling them they are looked down upon all over the country — well, shame on him. And in the high tourist season, it’s especially important that LePage welcome our summer visitors with a positive message and make sure their Maine experience is all that it should be. I wonder if he knows that his government spends $9 million per year to convince people to visit Maine? And that his constant and consistent negativity is not helping to attract tourists, or in any other way. This reminds me of the governor’s comment that our children don’t need to go to college. We’ve been working for 25 years to raise the aspirations of our kids. Of course they need to go to college! And when they get there, I guarantee they will not be looked down upon, nor will they be required to take special entrance tests because they are from Maine. Where does the governor get his information, anyway? It is so consistently wrong as to be astonishing. The governor said the College of William and Mary in Virginia requires Maine students to take placement tests before even considering their applications. William and Mary spokeswoman Suzanne Seurattan told our newspaper reporter Susan McMillan that this is not true. Well, I knew that from personal experience. Our three children graduated from Bowdoin College, Stonehill College in Massachusetts and Colgate University in New York. All three institutions are exceptional, and I am proud to say (yes, you are allowed to be proud of your kids and your state), all three did very well. You bet Maine kids can compete — anywhere and everywhere — from the world’s top universities to the Olympics. I took note of Alexis Baxter’s response. The Fullbright scholar graduated in 2008 from Winslow High School and said the governor’s comment, “really made me mad, especially because two of his kids went to the same college I did.” That would be Florida State University, where Baxter studied biochemistry. And while we’re on the subject of education, LePage’s suggestion that a student’s high school be forced to pay for his or her college remedial courses, if they are necessary, is inconsistent with his demand that we accept personal responsibility for ourselves and our actions. Those in the tourism business — our No. 1 industry — must have cringed at the governor’s “looking down” remark. I wonder if they tossed all those newspapers that morning, instead of delivering them to the doors of their hotel rooms? Well, don’t worry. You don’t have to climb to the top of the Kittery Bridge to get those who are traveling to Maine to look up to you. Lest you are feeling diminished and depressed by the governor’s remarks, let me tell you this. I have spent a lot of time in many other states in this country. People there have an idealized view of Maine, a state where community members care about each other, where the natural environment is clean, beautiful, and bountiful, where life is simpler and more fulfilling, where people are safe and secure. Everywhere I’ve been, when I tell people I’m from Maine, they look up to me. George Smith is a writer and TV talk show host. He can be reached at 34 Blake Hill Road, Mount Vernon 04352, or georgesmith [email protected]. Read more of Smith’s writings at www.georgesmithmaine.com.